14:20:01 Retweeted @FHQ 13:59:25 Sigh. Among the first lessons I share in my voting behavior/campaigns classes: Land doesn’t vote. People do. 19:08:37 Retweeted @kylegriffin1 19:02:21 NBC News: Dana Boente has been appointed to lead the DOJ’s National Security Division—the division that oversees the Russia probe. 4. Ha ha ha, suckers! 20:44:16 Retweeted @AlishaRai 20:05:29 Remember, if you see a space alien committing a crime, say you saw a space alien committing a crime. By calling 1-855-45-VOICE. 20:26:49 Listening to Our National Conversation About Conversations A… #1704: What have we learned? 21:20:46 Retweeted @DanSlott 18:09:20 In Pac-Man, were the ghosts originally from Pac-Man’s species B4 they died? Did they know him in their previous lives? 04:24:37 Retweeted @nick_field90 04:21:50 It’s April 2017. Two years from now in April 2019 the DNC will probably be holding the first debate of the 2020 presidential primary. 22:06:41 I’ve been busy with other things today. So something happened in France? 02:32:31 Retweeted @cIassicaIIy 2017-04-19 16:50:23 The fact that Head and Shoulders doesn’t have a body wash called Knees and Toes disappoints me almost as much as I disappoint my parents. 16:06:29 Feeling no strong desire to go to the Science March today… but feeling really guilty about it. Good enough? 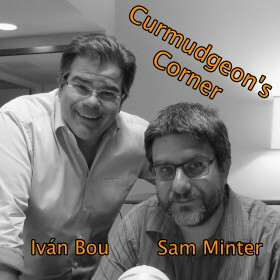 On this week’s Curmudgeon’s Corner Ivan and Sam cover all sorts of developments, both foreign and domestic. From the latest events in Turkey, the UK, and North Korea to the latest with Trump-Russia, healthcare reform, tax reform, and the death penalty. Along the way they also touch on flight simulators, random trips, a band from the 70’s, some feedback, and more! 00:11:56 Retweeted @JohnDingell 00:11:38 Safe to say @realDonaldTrump has had the least productive first 100 days in office.Except maybe Harrison, who died of pneumonia on Day 31. 04:34:30 Retweeted @rebliv 04:27:58 Every time I see the name Erdogan I think of Lord of the Rings.